With clothing, language, automobiles, and mobile phones, it is easy to forget that humans are primates (Figure 2.2). Anatomy and genetics indicate that primates as a group are most closely related to even less-humanlike animals: colugos (Dermoptera) which are gliding mammals from Southeast Asia nicknamed "flying lemurs" and tree shrews (Scandentia) which are tiny shrew-like animals that also live in Southeast Asia. All primates, with a few exceptions, share general trends in behavior, brain size, single offspring (not litters), extended stages of growth and development (i.e., prolonged "life histories"), sociality, anatomy, grasping hands and feet and useful thumbs, nails instead of claws, forward facing eyes, stereoscopic vision, a generalized (i.e., versatile) body plan, generalized teeth, a variable diet, a bony case for the three ear ossicles ("auditory bulla"), and an enclosed eye socket ("orbit"). Primates are classified into two major groups, or suborders: Strep-sirhines ("wet-nosed") include the lemurs and lorises, and Haplorhines ("dry-nosed") include the tarsiers, monkeys, apes, and humans. 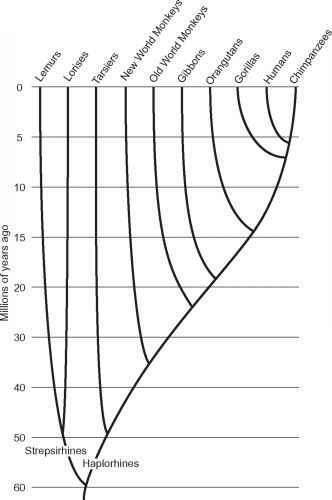 Figure 2.2 The primate Tree of Life shows approximate splitting times of the major groups. Illustration by Jeff Dixon. coast of Africa. Lorises are a group on the African mainland that contains slow-moving pottos and leaping galagos or "bushbabies." Tarsiers are somewhat difficult to group decisively with the lemurs and lorises or with the monkeys and apes. They have shared derived features with monkeys and apes in many different physiological and morphological complexes like in the eye (i.e., a light-sensitive pit in the retina of the eye for sharp vision ("retinal fovea") and the lack of the reflective back of the eye which enhances night vision, also known as the "tapetum lucidum" which is same thing as the shiny reflection of a dog's eye in flash photography). However, despite their derived features, tarsiers fit into the same level of adaptation as the lemurs and lorises and are sometimes grouped together into prosimians—a name that highlights the primitive, not-quite-monkey ways of lemurs, lorises, and tarsiers. Tarsiers have primitive features like an unfused jaw at the middle and grooming claws on some digits (instead of nails). This problem with confidently grouping the two main suborders of primates boils down to the fundamental problem with classification. Forcing an organism into only one group when it shares features with two is always going to cause a problem simply because of the branching and overlapping nature of evolution. Organisms that evolve near the split of major groups will resemble both groups. Primates are intelligent and have large brains relative to their body sizes. The major features of primate behavior—including group living, geographic boundaries, home ranges, prolonged mother-infant bond, long learning period, affiliations and coalitions (enhanced by grooming), and communication (vocal and nonvocal)—are all linked to their intelligence. Primate behavior and ecology are correlated with anatomy. For example, primate diet is linked to the shape of the teeth and skull which process food. Then body size and brain size are both linked together and both depend on the quality and amount of food. Adaptations for types of primate locomotion are evident in the chest, limbs, hands and feet, and tail. Primates manipulate and assess their environment with their hands, with stereoscopic and color vision, and with their intelligence. Clues to primate mating systems come from sexually dimorphic traits like canine and body size. Amount of primate social complexity may be correlated to brain size as well since complex social networks require complex neural networks to keep track of them. 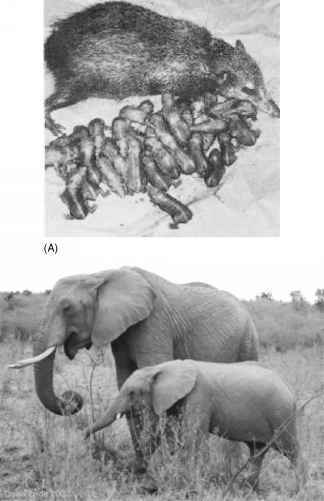 Home-range size depends on group size, individual animal size, food distribution, size of the habitat, and competition with other groups (within the same species or not). Types of social organization can cross superfamily boundaries within the primates. For instance, pottos (a type of slowlorise) and orangutans (a great ape) are solitary. All other types of social organization are gregarious, where adults aggregate in groups, and these include one male-multi-female groups (gorillas) and multi-male-multi-female (baboons and chimpanzees).